How a long war of necessity turned into an unfinished one of choice. Foreign policy is a murky discipline that often sees even the clear-eyed and rational at the helms of affairs regress into flawed reasoning about gains and losses. For the civilian leadership of the United States, the untimely drawdown of the combat mission in Afghanistan, denounced by its own generals in the Pentagon, may cost it much more than it gambled for. With the tense calm in Kabul frequently shattered by bloody attacks and kidnappings, while the Taliban are winning greater swaths of territory, and civilian deaths at an all-time high since the United Nations Assistance Mission in Afghanistan (UNAMA) started keeping records, current developments do not bode well for the country. The remobilization of the Taliban movement and its onslaught in the northern parts of Afghanistan has prompted the vice-president of the triumvirate government, the once feared and since subdued Abdul Rashid Dostum, to reassemble his equally terrifying militias. These developments are not just a disparaging commentary on the strained consolidation of the Afghan national security forces as viable protectors and defenders of the land, they also spell out a worrying prospect for Afghans, many of whom vividly recall the civil war years of the 1990s. Fear has crept back in, trust in the government is wavering, and growing anger simmers uneasily. For a campaign that cost the US $685.6 billion and 2,259 casualties, the current state of affairs in the country should give observers of the long war in Afghanistan cause for reflection. The combat mission has ended at a time when the Taliban and its affiliated factions–Hezb-e-Islami and the Haqqani Network–still remain deeply entrenched in the country, and genuine rapprochement with Pakistan is yet to be seen. Indeed, matters have only worsened recently. Since a string of attacks targeting civilians erupted early in the morning of August 7, with a truck bomb detonating in a densely populated area of Kabul, the usually conciliatory Afghan president, Ashraf Ghani, took to openly accusing Pakistan of waging an undeclared war. The Islamic State, too, has joined the fragile fray. A grisly video depicting tribal elders being killed on a misty morning in Nangahar by what appears to be IS operatives was released in the same week. While the consequences of disappearing gains locally in Afghanistan may appear contained, much stands to be lost globally for the United States if the unfinished combat mission is not resumed and the advice of the Pentagon heeded. We risk yet another Iraq, crippled by a premature withdrawal, rendering the vast expenditure in lives and treasure wasted. The ability of the U.S. to project itself as normative influencer, a first among equals, with a stake in maintaining order and systemic integrity globally is under dire threat by a looming crisis of legitimacy and the questioning of its moral fortitude. President Barack Obama characterized the campaign in Afghanistan as a ‘war of necessity’ as far back as 2008. However, the war’s putative last chapter, a troop withdrawal from an ambiguous and easily punctuated peace, points to it being one of choice. Wars of necessity hold an existential dimension: they counter a threat whose urgent elimination renders everything else (including public finances or the reputational concerns and legacy of a second-term president) obsolete. In the face of this exigency, even the strongest argument for withdrawal withers. Espousing a withdrawal in the years 2014-2016 could be tantamount to refusing to let sunk costs dictate an unsustainably expensive strategy. But, then, it was never a war of necessity – there was a choice all along. The pressure of a war-weary electorate during a prolonged recession, calling for withdrawal, cancelled out the premise that the hinterlands of the Durand border hid an existential threat. 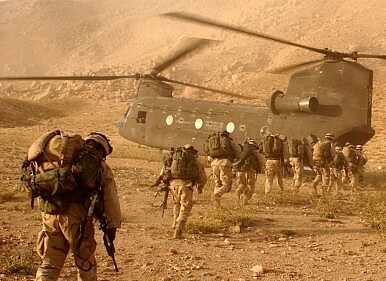 It is in this way that a withdrawal from Afghanistan amid insecurity in the country fuels a moral crisis for the United States: it, along with its allies, suffered thousands of lost lives and billions of dollars’ worth of treasure on a war of choice. All for what? For its NATO allies, the expensive involvement in a war of choice raises the same question. Were their fallen servicemen and women sacrificed to garner goodwill in Washington? If the war had been one of choice, then the deployment of troops, with all its grim wartime corollaries, was performative: an act performed by young men and women in the line of fire on an unsteady stage to appease a hegemon for the sake of alliance cohesion and closer economic ties. This is what an untimely, unfinished, and permanent withdrawal from Afghanistan will communicate about the nature of the war. That it was one of choice, clad in the rhetoric of necessity, and that the function served by troops was independent from their martial successes or failures. For the United States, there are grave losses to factor in when the moral cracks and inconsistencies of its strategic decisions become too visible, as is the case with the premature withdrawal from Afghanistan. Obama’s decision means that opposition will build against future interventions that threaten regional or global security. U.S. global normative influence will diminish further. Narratives like democracy and human rights that underpin systemic integrity in much of the free world today will be harder to propagate if U.S. credibility sustains too heavy a blow. In the adversarial and zero-sum realm of international relations, the losses of one party amount to gains for its opponents. In this particular instance, moral inconsistency on the part of former troop-contributing countries – the United States as well as its allies – will fan the flames of anti-Western resentment and make it hard to fight wars of necessity in the future. With its stock of trust plummeting, how can the U.S., as a hegemonic power, sustain its global presence? Despite the rise of the inwardly focused Donald Trump in the recent GOP field, it is hard to imagine the continuation of Obama’s measured isolationism as a viable approach for U.S. foreign policy, regardless of who clears the table in the next presidential election. Wide-spread unrest calls for a first among equals, a hegemon, to project power and uphold some measure of order. But the image that may linger for a global audience if Afghanistan falls is not that of a super power that gave its best, but one that scrambled aimlessly. Muska Dastageer is an alumna of the universities of Oxford and Copenhagen and founder of Untwine, a behavioral design and adaptive modeling lab that aims to improve the quality of development work in transitional and post-conflict societies. Omar Mateen's hate crime cannot be explained by his ethno-religious background. The Future of AfghanistanThe Afghan Endgame: What, When, and HowThe Afghan National Unity Government’s ‘China Card’ Approach to Pakistan: Part 2In Afghanistan, Talking and Killing Continue in TandemCan the Afghan State Survive the Peace Process?